Sunrise Family Resource Center and Vermont Arts Exchange continue their partnership offering weekly workshop sessions for dads and their children. Coming up will be a special “Holiday Workshop”, which will run 6:00 to 7:30pm on Thursday nights from November 29thto December 20th.Ramuntos will continue to generously donate a delicious pizza and salad that are shared at the start of class. Just in time for the holidays, these classes will focus on making gifts such as; wood burned coasters, printed wrapping paper, cards, gift tags and tote bags, wooden frames for photos or artwork and various sewing projects. VAE Teaching Artist, Kristen Blaker will facilitate this session. 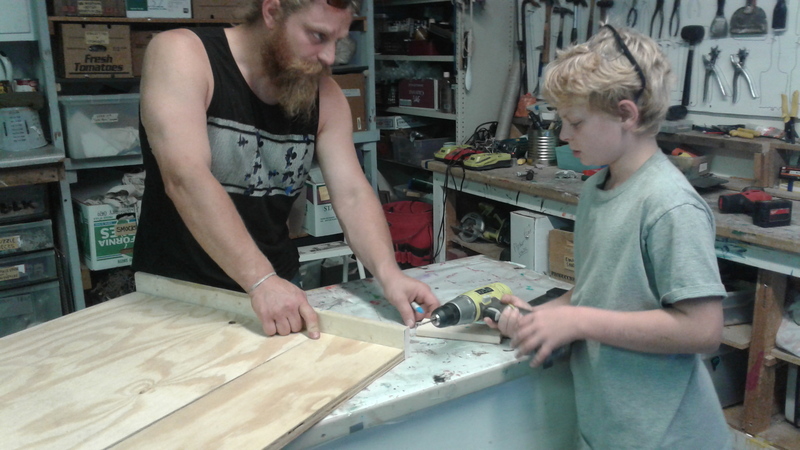 Upcoming Dad workshops throughout 2019 include; drumming, woodworking and some special one-day events so stay tuned for those dates. This program has been made possible through a grant from the Children’s Trust of Vermont and support from our local Ramuntos Brick Oven Pizza. The classes are no charge but registration is required and space is limited, first come, first served, no drop-ins. Active participation and supervision of your children is necessary.